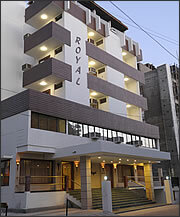 24 modern rooms with all facilities: Refrigerator in A/C Rooms, Phone. Central Location (only 1 km from the railway station, 6 km from airport), 24-Hour Room Service, TV, Multi-Channel Cable Network, Same-Day Laundry. Multi-Cuisine Restaurant (Indian, Chinese, Continental Food). A/C Conference/Party Hall (60 Seats). 37, Sampatrao Colony, R.C. Dutt Road, Vadodara 390 007, India.